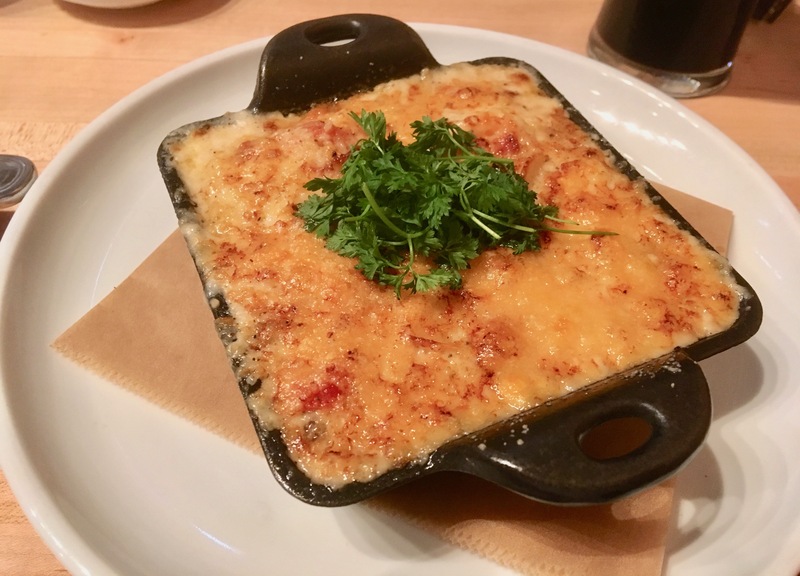 When looking for a restaurant to eat a quick pre-theatre dinner, we walked in to the recently opened The Glass House Tavern. This is a brand new restaurant opened about a month ago, if I recall correctly there used to be a Japanese / Asian restaurant at the same location. We didn't have a reservation but the restaurant wasn't that busy for 6:30 pm in the Theatre District. This is a bi-level restaurant with main dining room being up the stairs. Downstairs area features a large bar with some tables scattered. Hostess at the door walked us upstairs to one of the two-person booths. The whole place is brand new and you can see that they wanted this place to look elegant yet casual; very well planned out and decorated. There is a private dining area for groups with a small bar and fireplace in the back of the dining room. The service was superb and extremely attentive for this area of Manhattan especially before the showtime. Our waiter made sure that our meal was complete with time to spare to walk over to the theatre. There is a three course, prix-fix menu for $29.99, even though we didn't order from it, the food looked amazing with very generous portions. Starters averaged at $10 while the main courses averaged at $22-23. There is a well selected wine list and a small dessert menu of $6 each. Besides the dinner menu they also offer bar, lunch and brunch menus. Overall this is a restaurant we will happily return. We both thought that the food was excellent and the price to portion / quality was better than most in this area. We will certainly return when back in the Theatre District before this place gets discovered by the out-of-towners. Give them a try and you will be happy you did. They do take reservations on OpenTable.